But the thing is: America could. Only by acknowledging that, can America protect against it. How else to explain the rise of open socialists in Congress — the embrace of socialism among millennials — the growing acceptance of this form of government as an alternative to America’s democratic-republic? These things do not happen in a bubble. They’re warnings of where America is headed. A September 2018 BuzzFeed News and Maru/Blue online survey of 1,006 randomly selected 22- to 37-year-olds found 18 percent self-identified as a democratic socialist and 8 percent as a socialist, and 28 percent said they’d be either “much more likely” or “a little more likely” to vote for a political candidate who wore the socialist tag. An August 2018 Gallup poll found 57 percent of Democrats viewed socialism in a positive light, and 47 percent saw capitalism as a negative. 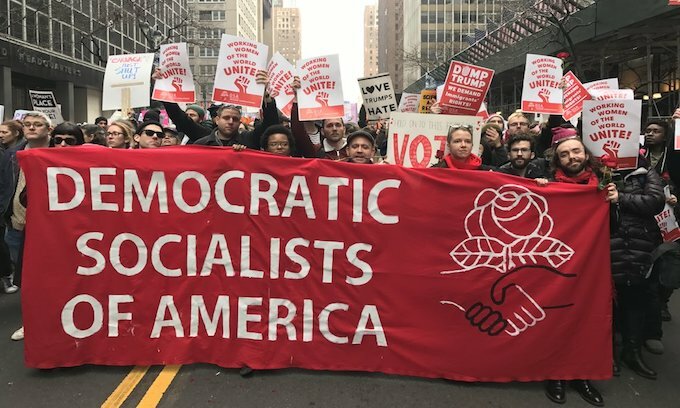 And the Democratic Socialists of America, a party that used to have no place in American politics — that truly should have no place in American politics — has made some dramatic gains in membership the last couple years, from 7,000 to a reported 50,000-plus since 2016. Those are the years Sen. Bernie Sanders really came out of the socialist closet; those are the years entitlement minds of millennials really started to grow; and those are the years border wars really heated. And that last raises a crucial point: If America really wants to save itself from turning socialist, the borders must, must, must be maintained. It’s hard enough keeping America free with the leftist forces currently in Congress, presently lobbying and demanding on Capitol Hill, already pressing for ever more progressive policies in the U.S. political system. It’s tough enough keeping America as the democratic-republic founders intended when those being raised as citizens aren’t being taught the core, key civics and history classes they need to not only understand the concept of American Exceptionalism, but to also embrace its values as their own. Now add foreigners into the mix who don’t want to assimilate, who come from countries where socialism is the norm and government hand-outs the expected — foreigners who vote for today’s leaders and who then birth and raise the next generation of the political class. See where this headed? Kudos for Trump for standing strong against socialism. It’s going to take a strong border and committed citizenry to keep this country on a constitutional track. America is only one generation away from socialism. And if truth be told, if these polls and surveys and political trends are taken with the seriousness they deserve, socialism in its softest form — the smiley-face giveaways, the social justice bumper stickers — is already here. Take heed: When the money runs out, it’s always the fisted, forced and enforced version that comes next. Ms. Chumley is 100% accurate in her assessment. The signs should be clear. From socialists in Congress as she points out, to educators being replaced by indroctrinators to attempts to rewrite the constitution and eliminate the first amendment and silence anyone who opposes them, and not to mention devaluing individualism by replacing I, me, he and she with we, us, they and them. These are all earmarks of socialism. Need more? How about trying to take God out of the pledge so that “The State” becomes that which we worship. The writing is already on the wall. To simply state that America will never be a socialist country is not enough. People and in particular our youth must be educated. They must see for themselves the atrocities that socialism has brought throughout history and we must take action against those who espouse it, whether in our schools, our media or sadly those who have infiltrated our government. Failing this, as many great civilizations that have come before, America can and will fall. Add to that, with the # of younger folk, massing into the hundreds of thousands now, that are brainwashed into loving socialism. EVENTUALLY THAT NUMBER will skyrocket as more and more colleges push this indoctrination. And over the next 20 years or so, THEY will wind up becoming the majority, just by sheer weight of Numbers. THIS IS WHY WE NEED TO win back our schools from the libtards. it’s easy for the younger population to believe in the latest “trend” of socialistic government while driving their fancy cars, living in nice homes, etc. I’d say few have to give their money away on any government funded program, or understand “government has no money without the taxpayer”. They have little understanding of Socialism and have never had to give up a thing. They have no idea, or would be willing, to hand over up 70% of their money to the government to fund others. All I can say to them is: Be careful what you aske for. One day you might just get it. So true K. They’ve had everything handed them from their parents, to the schools to the tax victim via govt handouts/school loans etc.. SO FEW if any have any comprehension of managing a budget, or actually EARNING a living. The Democrats jumped into bed with the Socialist, Communists, Antifa and other radicals and now cannot get them out of their party because it was taken over. Thanks to the Clintons, and BHO. IMO the dems have been in bed with the commies and socialists since the 60s! Tease people are AFRAID to use the word Socialist Period. Without the suffix DEMOCRAT, they would Disappear. Prove me wrong ,drop the word Democrat and just use SOCIALIST. Any one with Half a brain Knows a Democrat and a Socialist are at opposite ends of the poles. This 91 year old Democrat is Living Proof of That !!!!!!!!!!!!!!!!!!!!!!!!!!!!!!!!!!!!!! stock up on essentials and ammo the fuse has been lit. And keep your guns well oiled! Yeah, going to happen. Young people have no respect for what America was about. They think they can do socialism better than the idealists who tried it before them and failed. As they worship the gods of abortion, entitlement, promiscuity, deviantism, and environmentalism the true God will continue to remove His hand and allow us to skip gleefully down the path of destruction. You can even see democrats being eaten alive by the monster that they themselves have created, which is fueling this socialist penchant of the new left. One thing I will mention. We are not a democratic republic. We are a constitutional republic. They ALWAYS think they can do socialism better – the same fallacy that has caused tens of millions of deaths during the last 100 years! However, I have hope for Generation Z (the kids under 20). They are actually the most Conservative generation in decades. I believe some of it has to do with rebellion – always do the opposite of what your parents tell you – but more so due to the growth of homeschooling and vouchers for private and/or Parochial schools. The only way we can ensure our children are being taught morals and values is to take control of our children’s education. Disq.. Like you , i fear eventually this might come to pass. BUT hope and pray i am long dead before it does so. If Dems ever get the white house and congress, you can bet on it. I hope the Socialists know that this country will go socialist only over the dead bodies of millions of veterans, police, NRA members and any other patriots who swore a lifetime oath to defend and preserve this Republic. My belief is that these people can and will fight for this country because of that unexpiring oath. Unfortunate;y, many of our commie Congresspersons who took the oath, lied when they swore to defend our Republic. Shame on them. Don’t underestimate us! This. Going socialist is well past the point where they start the new Civil War. We already know the Dems want all conservatives dead. They don’t even try to hide it anymore. They’re itching for a Civil War. This time instead of blue and gray, it will be blue and red. We can either die fighting in the Civil War or die in the reeducation camps. Soon there won’t be any middle ground. And let’s be clear here. If not for Trump, the bullets would already be flying. Hillary would have started the Civil War and laughed while we burned. It’s such an understatement to say she’s evil. Trump needs to really turn things around and crush the Deep State completely. If not, then he’s only postponing the Civil War. Socialist America? Not on my watch by God! I wish i had that much faith, as you seem to have, in people standing up and fighting, because of that oath. Anyone who thinks the rise of socialism is an annomly think again. The socialist movement in the USA and other countries is inspired /funded in large part by none other than Gro Soto’s and he’s been at it for many years. His network is extensive and known as “ The Ghost Party” It is an extensive network of socialist operatives masquerading as patriotic organizations. Want to know who they are, browse Discover the Networks”. The storm is on the horizon, and without an Opposition Party the Communists will go unabated and overtake us by numbers alone. We have a Leader, but he stands alone, as his party has colluded with the enemy to destroy him and our country. I no longer look at the Republicans as my party, I look at them as the Traitors and Cowards that they are. And at least the dems are UNABASHED about their hate for this country. This is why 2020 elections are supremely important – we Must give Trump a Red Tsunami – he must have conservatives in congress & the House to push legislation away from this dangerous trend promoted by Democrats.